Should be cool for both iPhone developers and customers alike to see trends and what is new, cool, or on the move in the AppStore. Developers can bookmark your company list to quickly see how all your Apps are doing each day without needing to click through dozens of category lists in iTunes. Check it out! Pass it on! Enjoy! To the right is today's chart (August 14, 2009) for the Postman app. This was featured on the 'what to do in Paris' commercial about a week and a half ago. 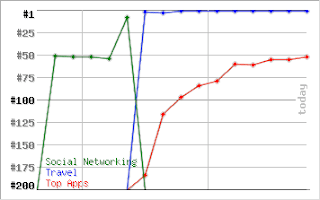 You can see that the day of the commercial, the app was moved from "Social Networking" to "Travel" category. It then rocketed up to the top of the Travel category. It also entered the "Top Apps" list as a result of the commercial, and over the course of a week got up to about #50 in the overall apps! When the commercial ends its run, the App will probably drop down... Pretty cool what being featured on an Apple commercial can get you. We had a similar response (but no chart to show) when our iCatchall:tools app was selected as a "Staff Pick" in the AppStore in March of 2009. It was the #1 Business app for a week or so. PS: New versions of Heads Up: Hold'em, Heads Up: Hold'em Free, FTP on the Go, and WiFi Disk should be arriving in the AppStore soon.